Raised in our home with family and other pets and well socialized. The ultimate in hypo-allergenic (Low Allergy) Retriever's. Our health testing includes OFA hips & elbows, Eye CERF, Cardiac, Von Willebrand's disease (vWD), Neonatal Encephalopathy with Seizures (NEwS), Degenerative Myelopathy & Thyroid on adults before breeding. Companion pups sold with limited registration, with spay/neuter contracts. Show/performance prospects on co-ownership under special treaty. Health guarantee & lifetime return policy. Click on the Girl's names for their pedigree and current health testing. 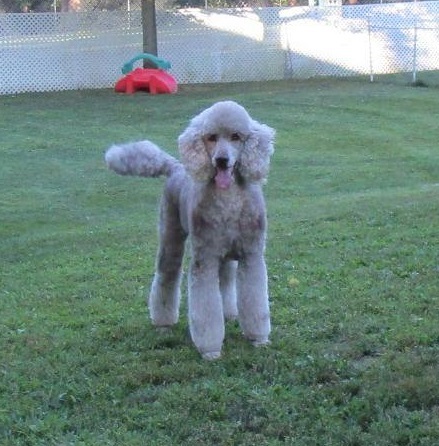 Top Ten Multicolor Standard Poodle in the Country for 2010, coming in at #8 with limited showing. Top Ten Multicolor Standard Poodle in the Country for 2009, coming in at #5 with limited shows. Java held the #4 in Top Ten in June 2011 and tied for the #9 spot in July 2012 with her 11 month old Son, Andy. Java is our beautiful UKC RBIS Grand Champion Brown & Apricot Phantom girl. Java exhibits natural hunting instincts with an all day long retrieve drive, despite her high drive she is equally as happy laying in your lap all day if that is what your are up for. She is a gentle soul with an incredibly sweet and intuitive temperament with a great aptitude for working. Java entered the UKC show ring for the first time just under 8 months of age and took home Best of Breed, Best Female and then went on to take Two-Group Three Gun Dog Wins. In just two days out and in only four shows, she wrapped up her UKC Championship Title at 1 1 months old with two Best Of Breed & a Group 4 wins. Java continues to bring home Best Of Breed & Group wins at most shows out. Java may come in a smaller package at 21" and 38 LBS but she is mighty in her personality, she rules the roost and the boys know it! 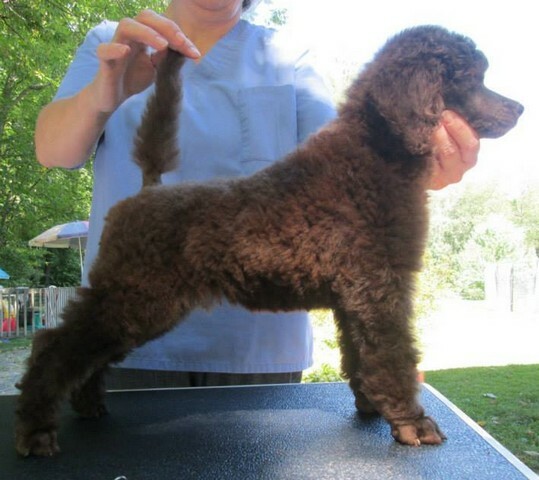 Java is the FIRST Brown & Apricot Phantom Standard Poodle in UKC history to achieve the Title of Champion & Grand Champion! Java is also an AKC Canine Good Citizen. Enjoys training in K9 Nose Work and also she enjoys visiting the Senior Center's for some emotional Therapy work. "Cilla" is our keeper girl out of our 7/5/2014 Elvis Presley litter, sired by our UKC Champion Aidan and her dam is our UKC Grand Champion Java. Cilla has loads of retrieve drive like both her parents, and she maintains a very gentle easy going temper much like her dam. We were unable to get her into the show ring as a youngster due to family health issues at home, hopefully she will make a UKC show debut the Summer of 2018. Cilla is natural tailed and dewclaws are intact. Born a dark brown she has matured to a beautiful silver beige, she is a beautiful mix of both her sire & dam in both conformation and temperament. 8 week old Conformation evaluations of her litter. More Information on Cilla's Llitter here. Meet our little BRIDGET she is our Shane's daughter, she is Parti & Phantom Factored. BRIDGET is full of Sass, a very quick witted little girl. She is doing superb with her clicker training. We are pleased with her working brain and seems to be following in the "paw-steps" of her 1/2 Sibling's Adam & Andy, at 9 weeks old she started her training on turning off/on light switches & retrieve to hand. We will continue to watch her conformation as she matures and hopefully make her debut her in the show ring. Bridget is 21" & 40 Lbs. at 3 yrs old. **Bridget is available to a loving Home for a reduced fee. Visit her page for more Info. Our girls have all genetic testing current and normal and they are dual registered with AKC and UKC.